20 new mobile broadband subscriptions activated every second. As of now, there are the same amount of mobile subscriptions as there are people on the planet. 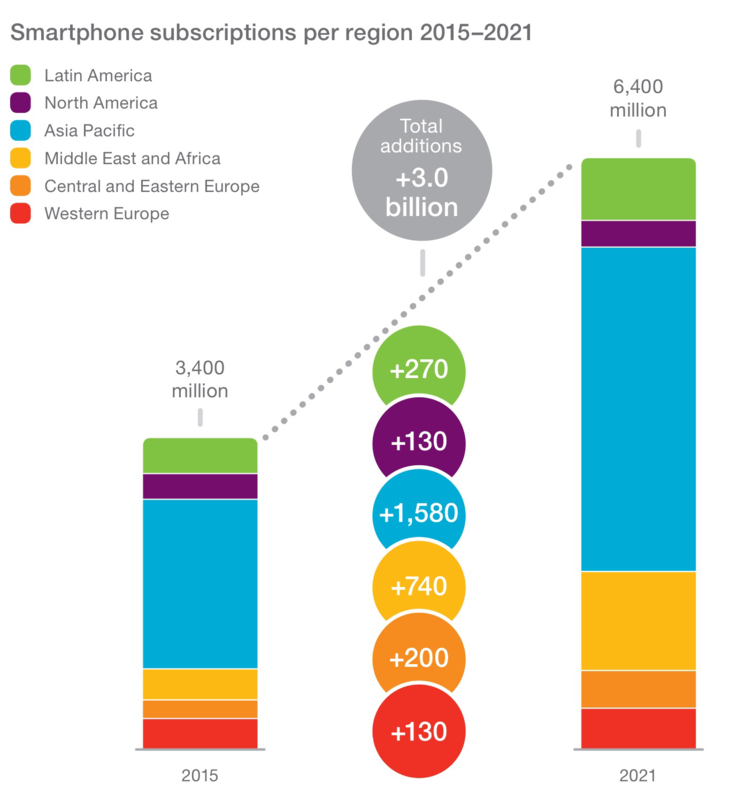 By 2016, we will hit the four billion mark for smartphone subscriptions alone. At end of this year, China will account for 35 percent of world’s LTE subscritpions, or roughly 350 million. There will be about 1.2 billion LTE subscriptions by 2015 and 4.1 billion by 2021. 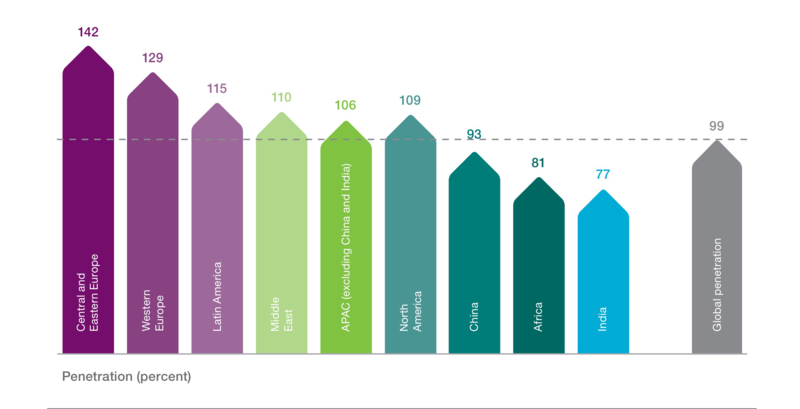 By end of this year, Africa will have a billion mobile subscriptions, double the number of subscritipons in 2010. Global mobile data traffic is forecast to grow ten-fold by 2021, and video is forecast to account for 70 percent of total mobile traffic in the same year. Mobile video consumption will drive around six times higher traffic volumes per smartphone in North America and Europe (2015 to 2021). North America data traffic per active smartphone will grow from 3.8 to 22 GB per month by 2021; in Western Europe, the increase is from 2 to 18 GB per month. In Asia, it will grow from 1 to 6.9 GB, while Africa will see it zoom from 1.1 to 6.3 GB per month. In Latin America and Central/Eastern Europe, the data usage in 2021 is expected to be roughly six times of current usage — 6 GB/month. In many mobile networks today, 50–70 percent of video traffic1 is from YouTube, Ericsson claims. Social networking traffic will decline from 15 percent in 2015 to about 10 percent in 2021, which isn’t surprising considering that video is such a dominant part of the future and the data is streamed in much larger quantities. So what does all this mean? I think what mobile has done is “freed” from conventional, location-specific ideas – cultural, social, commercial. The ease with which we will continue to get on-the-go broadband connectivity is only going to increase. As countries like India continue to become more mobile broadband enabled, more we are going to see that society transform. Same goes for the continent of Africa, which will rewrite the rules based on geographic and local needs. The more I look into the future, the more I realize that we in Silicon Valley will have to actually start to rethink how we engage with this future, which isn’t going to be born in San Francisco. Where others see roads, I see networks. Whenever I drive from San Francisco to Los Angeles down I-5, I wonder to myself whether McDonald’s and every other fast-food chain would have thrived had there been no interstate highway system. Would FedEx exist but for the invisible but very real infrastructure of airports, air routes, and roads? Railroads, freighters, factories, mass production—everything happened because the power of steam was made mobile. That created the Industrial Revolution and the Victorian age, and it altered the face of the entire planet. Today, it’s the increasing mobility of “computing engines,” the marriage of microprocessors and Internet ubiquity, that is poised to reimagine our society. More than a billion people bought smartphones last year—or to put it differently, we added 1.2 billion nodes to what was already the largest network ever built. Networks—social, neural, physical, metaphorical—enable connectedness, and connectedness changes everything. Networks compress distance and time, that concentration speeds up life, and that, in turn, creates sociological and economic change. The fundamental changes ahead don’t distract me from seemingly dubious assertions in the report. 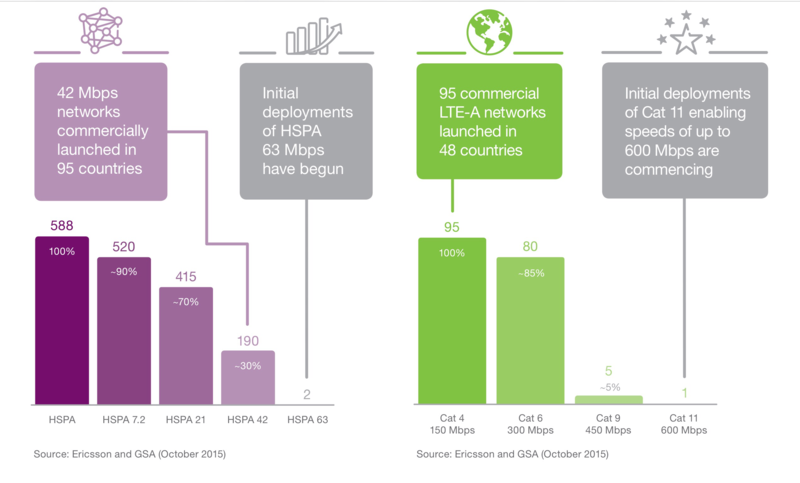 No matter what Ericsson says, they don’t have the ability to accurately forecast timelines. Like all equipment makers, they have a vested interest in hyping things up and not stay focused on reality. Take for example, this assertion: that by “2030, ICT could enable reductions in greenhouse gas emissions equivalent to the current carbon footprint of the US and EU combined.” How is this exactly going to happen? What is the source of change? Again, there are more questions than answers. Similarly, they are making some bold predictions about the future of wirless networks — aka 5G, which at best is a marketing term with very little meaning. Ericsson is forecasting 150 million 5G mobile subscriptions by 2021, less than a year after it is expecting to have commerical deployments of such networks. WTF is 5G anyway? “South Korea, Japan, China and the US are predicted to lead with the first, and fastest, 5G subscription uptake,” the report says. From most of the reports I have read, that if we get so called 5G test networks ready by 2020, we should be so lucky. I have no problems with Ericsson’s version of the future, I do think they are overtly aggressive on their timelines. More on this 5G stuff later, but for now here are some pretty (colorful) charts, for your daily dopamine fix.